Santa Fe: A millionaire project built upon the Other | Beyond "he" and "she"
Mexico City is one of the largest metropolitan regions in the world and the capital of a country labeled as an upper middle-income country by development organizations such as the World Bank and the International Monetary Fund. Despite this somewhat arbitrary categorization, poverty can be seen in any city of the country and, in any area of the megacity. Mexico City produces approximately 22% of the country’s GDP and is ranked as the 8th richest city in the world. The city is also extremely well ranked in the list of worldwide slums. The Neza-Chalco-Itza area is the largest slum in the world with approximately 4 million inhabitants. This research focuses in one particular neighborhood of Mexico City: Santa Fe. 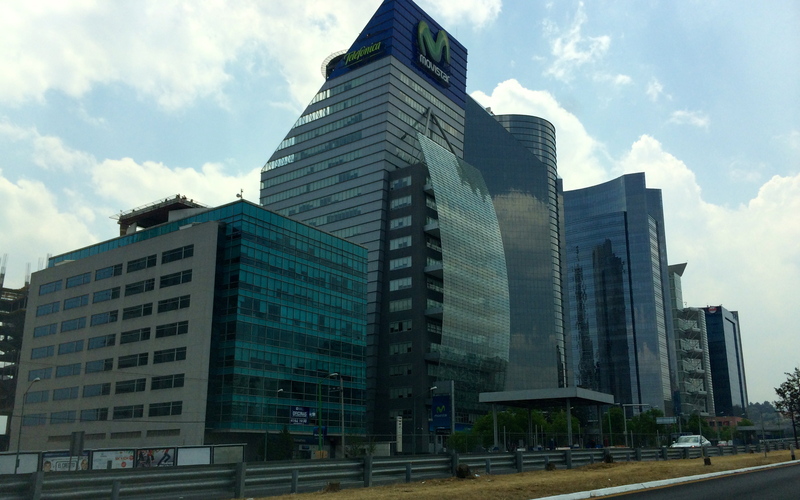 Once the city’s largest garbage dump, Santa Fe is now Mexico City’ major business district known for its commercial skyscrapers surrounding one of the largest shopping malls in Latin America. This research is structured in three main sections. I first present the history of Santa Fe, the foundation of the slum and informal landfill. I analyze the social and environmental threats in the area and the unequal distribution of these threats. I study the specifities of the neighborhood and marginalization inside the slum, the consequences of exclusion but also the damage of some of the Government inclusion initiatives. The second section presents the Megaproject in Santa Fe: the transformation, reallocation of dwellings and re-creation of slums bordering the commercial area. I discuss the discourse behind the State’s intervention and the reaction of the people living in the site. Finally I study Santa Fe as a global city analyzing the role of the Other in this transformation. I will analyze the difference between the two groups living in a same area and the common ground shared in the everyday life. This research questions the indifference of the inhabitants of the luxury residences that can usually witness the poor living conditions of the slums by looking through their high-ceiling window bay. My purpose is to identify the inseparability of environmental issues with the social conflicts of the area and the sustainability of an overcrowded megaproject spread in a rhizomatic fashion with no urban planning but persistent growth and commercial investment. As in many countries of Las Americas, the marginalization side of this story starts in the 1960s, with the implementation of rapid industrialization that triggered an intensive migration from the rural cities of Mexico to the capital seen as a space of opportunities. As in many situations of intensive migration, the recipient space did not have the infrastructure to absorb the new inhabitants in the economy: there was a lack of public services, a deficient housing supply and a predetermined repartition of resources among the elites of the country resulting in squatter settlements which emerged as an irregular market to satisfy the increasing demand for housing. Economists study this phenomenon in two words: demand and supply. 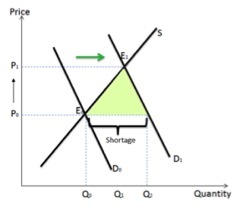 A very simple graph illustrates how, as the demand exceeds the supply, prices increase and a third component appears to cover the shortage: the informal market. The problem with this analysis is that linear shortage and categorical informal markets are based on assumptions and oversimplifications that erase local differences and particularities. The Mexico City Metropolitan area is located in a valley at an altitude of 7,200 feet above sea level with a total urban population above 21 million. The capital was originally founded by the Aztecs on a small island in the Lake Texcoco, one of the original five lakes that characterized the Valle de Mexico. The Aztecs named their city Tenochtitlán in 1325. The Aztecs setlled around these lakes and built a series of canals that were used for transportation and agriculture. As the Aztec empire was growing and becoming more powerful, Tenochtitlan soon became one of the most important cities in Mesoamerica. Between the time of the Spanish conquest in 1521 and independence in 1821, the city’s overal design and style changed to include colonial architecture and the natural environment was affected by the gradual drainage of the lakes. Mexico City grew as the center of the country expanding over unstable soil conditions, resulting from building a city over lake beds. This inheritance is remembered every year through constant floods and the gradual sinking of the city’s center and downtown areas (up to 12 inches each year). The urban repartition responds to this environmental threat where the upper middle income class aglomerates in the northwestern part of the city, away from the sinking zone, more affected by the floods. The fragile structure supporting the city is the cause of many of the local environmental and social challenges. On September 1985, Mexico city suffered an earthquake of an 8.1 magnitude where at least 20,000 people were killed and more than 100,000 lost their home. More than 5 million people lost access to potable water after 6,500 meters of primary and secondary water and drainage pipes suffered breaks in 163 places, cutting off water or contaminating the pipes. More than 130 schools collapsed and 1,687 school buildings were damaged. As David Carruthers explains in Environmental Justice in Latin America, 2012, distribution inequalities are seen in both environmental goods and bads. The people that are not included in resources distribution and formal housing supply are the most included in environmental disasters hence, the most affected by the ‘85 earthquake. The governmental response to the massive earthquake was slow-moving and inefficient, exposing a concerning lack of government’s capabilities and resulted in a unification of the population that proactively reacted rescuing trapped people, finding needed resources, and distributing these. 1985 has been identified as a rupture in the relationship between the government and the Mexican people who were cornered to work together thus inciting a new sense of community, civil responsibility and growing critical views toward the government. Mexican writer and journalist, Carlos Monsivais Aceves, described the earthquake as a moment of discovery among the ruins where the existence of society appeared as a discovery in the most physical sense of the word. The earthquake also resulted in a urban redistribution away from the center of the city that was the most affected area. Only two years later, in 1987, Mexico’s foreign debt reached its highest historical level at 96.6 billion dollars. The IMF decided to put Mexico on hold after its failure to comply with the IMF’s economic reforms. As Mike Davis points out in Planet of Slums, Structural Adjustment Programs (SAPs) imposed by foreign aid organizations urged many countries into a globalized capitalism by the way of liberalization and privatization. Mexico City was particularly affected by the structural adjustment policies as a city still in recovery from the massive earthquake and the enduring migration coming from the coast and rural areas. Formal sector unemployment increased along with disparities among the population where a powerful elite was growing exponentially to rule the country. Facing the IMF petitions, Mexico had to cut down their debt and, as a consequence, funds for investment on public health, services and infrastructure decreased. Akhil Gupta analyses this sudden transition to neo-liberalism in her work, Red Tape, Bureaucracy, Structural Violence, and Poverty in India, 2012. She explains social democratic states in the industrial world where the transition from a sovereign welfare state to a neoliberal market economy has meant the rolling back of government expenditure on the care of the population. She then questions: what happens for a nation state that did not have a welfare state in place and was not providing security to its citizen before the transition? Mike Davis see this unplanned transition to neoliberalism as the main promotion of hasty urbanization schemes without proper industrialization, resulting in a ‘’surplus humanity” and informal urbanism in the slum. This surplus population lives outside the formal economy in Mexico inhabiting, what Davis names, the planet of slums. Davis blames neoliberalism for the crisis of economic informality. 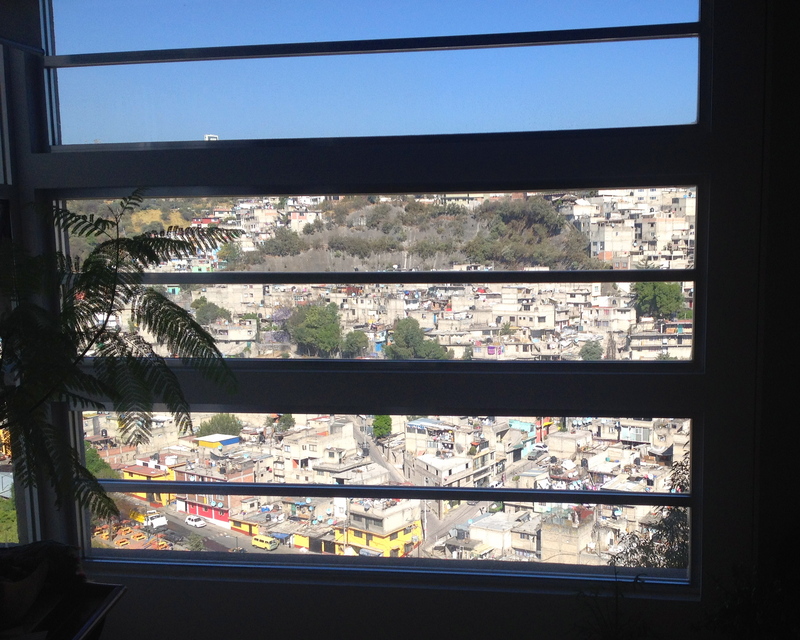 By the early 1990s, Mexico City counted 9.6 million people living in informal settlements, equivalent to 60% of the total population at that time. Santa Fe is located 8.4 miles southwest of Mexico City’s downtown. The Santa Fe slum was born as a shortage consequence and, as we will show in the following sections, its settlement and growth is nothing alike the linear formation presented by economists. In the 1950s, the zone – nowadays hard to delimitate – consisted of more than 3.5 square miles of an irregular topography in a deep valley of sand mines. The area and its inhabitants were quite remote from the urban activity that was concentrated in the central part of Mexico City. Informal settlements, more than 2,000 people then, expanded in the area where fragile dwellings were established in the unstable soil of Santa Fe Valley. The already abundant squatter settlements multiplied after the 1985 earthquake when more than 100,000 people lost their homes and by 1990, there were almost 5,000 peopleliving in this distant area, neglected by the state as there were no proper roads connecting the area to the rest of the city. The slum “called attention to the importance of borderlines and margins as peripheries where inhabitants find themselves between inclusion and exclusion, legality and illegality, order and disorder, ruled and unruled”. In this description, Maria Clemencia Ramirez is presenting an isolated Colombian territory, the Putumayo, but her view on the marginalization of a territory by its isolated geography, where the state control remains undefined illustrates perfectly the position of Santa Fe. So the garbage from the millionaires’ mansion mixes with the garbage from the poorest favelas? Santa Fe had been unofficially utilized as a garbage dump for years and in 1957, the Mexican government formally proclaimed the Santa Fe landfill. This recognition was the first explicit act of acknowledgment of the area and its inhabitants made by the government. The dwellings of the slum bordered the dump and people living in the area worked as pepenadores (scavengers) collecting recyclable materials to sell. As Maria Jose Zapata Campos and Patrik Zapata explain in their study of la Chureca, Santa Fe’s dumpsite informal settlements implied severe social conflicts due to over-urbanization and marginalization entailing lack of services and access to clean water. The acknowledgment from the government did not include recognition of the social and health threats of the area. These issues and the people remained invisible. The slum had a designated leaders, Luis Tellez, who maintained relations with the Government that recognized him as the founder of the Santa Fe garbage dump in 1957. This recognition offered two benefits for the State; not only the dump processed an important part of the garbage produced by the city receiving 3,000 tons of garbage per day that accumulated there without sanitary control or government financial or social support, but also, it was one of the most important source of recyclable materials. The government, by recognizing the leadership of Luis Tellez, was able to obtain some benefits from this isolated area without the need to invest funds in the area or absorb the social cost of including the people in the formal society. In addition, from a political point of view, the then ruling official political party, the Partido Revolucionario Institucional (PRI) secured votes from the pepenadores trough their leader. The theoretical framework used by Zapata and Zapata (2013) based on Czarniawska’s conceptualization of city management as a complex “action net” applies to the way the Santa Fe dump was formed. The landfill worked through collective and interconnected actions following a specific “institutional order, a set (not a system) of institutions (not necessarily coherent) prevalent right then and there”. The people living and working in Santa Fe followed this action net and the government was “just one point of entry”. With time the actors involved in this net multiplied to include beside the pickers, government and community leaders, the politicians, aid workers, planners, architects and multinationals. The garbage area expanded from 7.9 to 69 hectares in 30 years. As the area expanded, the living conditions of the people in the garbage dump remained deprived. Dwellings had no water or drainage and people had to get their electricity directly from the electric poles; system known as the diablitos in Mexico. There was an established hierarchy within the site: the quality of the shelters varied depending on the status of the family in relation to the leaders of the dump. The streets, such as they were, were named after the recycled materials: Cardboard Street, Glass Street, and Aluminum Street among others. People working in the landfill had roles; pepenadores who had a privileged relationship with the leader would be in charge of the material with higher monetary value such as glass, aluminum or PET12. The leaders were in charge of the trade and of distributing the earnings. It worked “like a stock exchange, they collect whatever the market demands at any given time” and the leaders were in charge of monitoring this market. Carlos Hank Gonzalez was a Mexican politician part of the PRI appointed regente (mayor) in charge of the Federal District from 1976 to 1988. He was then appointed as Secretary of Tourism and Secretary of Agriculture and Hydraulic Resources in 1990 – he was also accused by the U.S. National Drug Intelligence Center to be involved in drug trafficking and money laundering. After the earthquake and Mexico’s failure to meet its debt requirements, the international status of the country was in question. The State needed a strategy to gain international recognition and reposition the country; for this, the country needed a “space to symbolize Mexico’s global corporate power to the world”14. This space had to be in the capital of the country. Hence, as the population increased and the urban activity expanded to the borders of the city, the once remote and inaccessible Santa Fe turned rapidly into a neighboring community. Figure 2 presents this urban population growth. 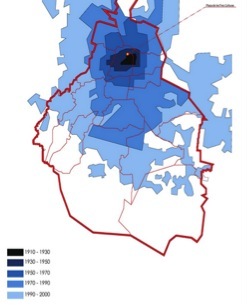 The red symbol represents the location of Santa Fe and the concentrated black area in the first graph represents the city’s historical urban center. Santa Fe started to be noticed as an underutilized territory, and soon, Hank Gonzalez found the ideal place to “build his Manhattan”: Santa Fe was perfect to develop the new business center. 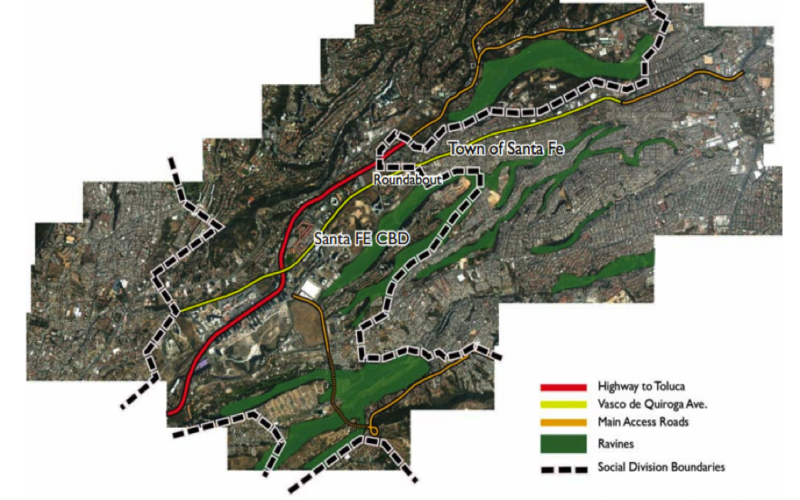 The master plan for the Santa Fe area initiated in the 1990s. This is how, the millionaire project started on an inhabited land polluted by mining and garbage activities. The transformation from an unrecognized land into a prestigious and expensive space required drastic changes to be supported by government authorities and the private sector. The first project was the construction of the new campus for a prestigious private university, the Universidad Iberoamericana, which nowadays is the second most expensive university in the country. 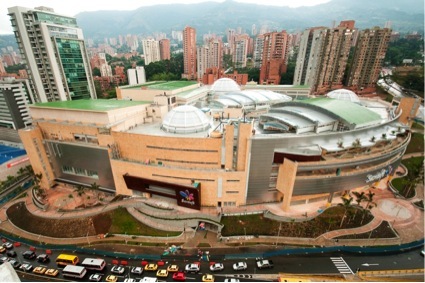 The second initiative was the establishment of the biggest shopping mall in Latin America, the Centro Comercial Santa Fe. Along with these edifications, intensive marketing policies and advertising activities were implemented to attract global investors which was a difficult task considering Santa Fe was still seen as the City’s dump and the pepenadores were still living in the area. Nevertheless, in a few years, the Association of Settlers Zedec Santa Fe was created to support the project with the first investors – Mercedes Benz, Hewlett Packard, Ford and Chrysler among others – establishing their main local offices in Santa Fe. Additionally luxury residencies with advanced security technologies for private properties were built. In Mexico these are usually constructed as closed areas that include all the services, retail and entertainment providers so the inhabitants don’t have to bother and venture outside the fortress. The self-contained, almost autarkic constructions appear to be absolutely independent avoiding as much as possible any interaction with the public sphere. Yet, most of those luxury constructions do not have access to a proper sewer system, which was not considered in the megaproject plan; sewage waste from the luxury houses ends up going into open ravines. Praised as the “new city model” and the “biggest residential development of Latin America”, Santa Fe sprouted on the west of the capital as its most notorious corporative and residential area. Soon, living, working or shopping in Santa Fe became an aspiration and a symbol of status for the Mexican society. In the first five years of the project, 16 million square feet were commercialized generating a profit of approximately 85 billion dollars for the mentioned investors. Despite being regulated, the intervention was developed from the beginning with severe infrastructure problems. The urgency to distribute profits on the millionaire investment overlooked the need of profound urban planning to raise huge edifications on Santa Fe’s unstable soil. The extremely rapid expansion of the project and this lack of proper urban planning resulted in inadequate roads, transportation, sewer, water and energy infrastructure to support the massive commercialization. This lack of infrastructure and over-investment has created an oversupply of commercial real estate and yet despite criticisms from urban planners, economists and social communities, Santa Fe continues to expand. The megaproject constructions started bordering the slum with no formal announcement to the community when the government knew from the start of the plan that the total displacement of the garbage pickers and local inhabitants would be needed to complete the megaproject. “The pepenadores will abandon Santa Fe only if they are offered an alternative dignified place to live in with feasible options for work… even though an ambitious project is being built in the area and has been completed by 40% … up till now the authorities have not mentioned the possibility of relocating them”. The displacement of 300 families was approved that year by the government to allow the land works to start. The leaders had gained power through their involvement in the garbage business and the community had an established system that would not be easy to dismantle. After the outspoken opposition of the leaders, the government started a negotiation with them regarding their displacement. Government officials confirmed the authorities offered the leaders with a financial compensation to convince them to support the relocation. After this, leaders’ attitude changed radically to support the relocation. The leaders separated themselves from the people living and working in the landfill, they became detached actors, still interim as negotiators between the pepenadores and the state but persuading the formers to leave the site. A group of pepenadores, aware of their leaders’ settlement with the government, decided to resist and defend their own interests. Despite this opposition, the government determined that the families would be relocated to two different neighborhoods: Tlahuac and Iztapalapa. Manifestations began as a formal resistance to the government violent reallocation initiativeand the dwellers that were relocated, soon resettled in the nearby hillsides very close to the new megaproject. Nowadays, two areas divide what was once known as Santa Fe’s dumpsite: the business central district (CBD) and what is now called the Town of Santa Fe. Figure 3 shows the proximity of the two Santa Fes as overlapped areas. To conclude on the history and expansion of Santa Fe into the CBD and the Town, the demographic expansion of the dumpsite resulted in the consolidation of a city outside the city excluded from the labor market, public health, social rights and any form of government support. The State’s presence in the area was sporadic and driven by business intents. As stated before, the boundary that segregated Santa Fe from the rest of the city was removed with the expansion of the urban population and the megaproject. This boundary reappeared between the CBD and the town of Santa Fe. Arturo Escobar defines Place as “the experience of a particular location with some measure of groundedness (however, unstable), sense of boundaries (however, permeable), and connection to everyday life”. Based on Escobar’s place-based approach, we will analyze the articulation of difference of Santa Fe in a context of globalization. the movement of negation of the negation. The Santa Fe megaproject was presented as a new development model with a combination of state intervention and the support of private investment. Executive planners promoted the idea that project would provide benefits for the rest of the city by stimulating the economy, multiplying the resources and revitalize the area with parks, art and entertainment venues. Economists were explaining the project in their own simple linear terms. The commercialization of the area would create new jobs, increasing the active population of the city. Economic growth that would result from international investment in the country would promote and eventual convergence and redistribution of wealth. We were back to the classic economic view and the invisible hand of Adam Smith. This was then the discourse to “legitimize the intervention” and the top-down approach avoiding local contestation. Facing the imminent order of eviction, pepenadores initiated public demonstrations and protests. As displacement methods were getting more and more violent, the pepenadores denounced the authorities with the Mexico City’s Human Rights Commission. Facing the international pressure and increasingly unfavorable public opinion25, the use of violence was diminished. In 1994, as the struggle continued against the displacement, the government announced a new program to justify the Megaproject. The project would “dignify the quality of life of the pepenadores who had been neglected and marginalized for centuries”. They would finally be incorporated into “the formal sector as solid waste selection technicians, and their families would be integrated socially and economically as formal members of the City”. Escobar studies this type of hegemonic discourse citing on Enrique Dussel, for whom a notion of exteriority arises from the visualization of the Other through a liberation philosophy framework. After years of marginalization, the State was intervening to liberate pepenadores from their informal status. This framework fails to recognize any existing action net (Czarniawska’s conceptualization of) and the local knowledge that had been in place for years. It also fails to convince the local people that the interests behind the liberation are aligned with theirs. Where would they be reallocated? How would they be compensated? How much would this compensation be compared to the expected return of investors? As the resistance persisted, the gap between various actors’ interests increased and the State discourse was revised. The government started justifying its forced displacement by criminalizing the pepenadores: illegal guns trade, vandalism and robbery in the slum represented a threat to the city and the State had to intervene. Gupta analyzes poverty by questioning if its related violence is the result of the fact that “the desperately poor are left out of the project of improving the condition of the population”. At some point in the intervention, the Other fails to fit in the linear equation of growth and convergence. To maintain the initial graphic as it should look, the Other is better left out the equation. The Santa Fe Megaproject was launched with the expectation to position Mexico City in the global cities network. The city was aiming to consolidate a cosmopolitan image that was key to articulate the country in the global economy. Santa Fe became a brand for the city with the intention to reflect arbitrary globalization ideals through luxury residential communities, shopping malls, private clubs, upscale restaurants, hotels and prestigious schools. To support that objective, the other previous image of an indebted city, agglomerated, polluted and poor that could be seen in the informal settlements and landfill activities had to be displaced; the Other had to be covered as Escobar phrase it in the “the systematic act of encubrimiento del otro”. Escobar discusses the imperial globality that can be recognized in the arbitrary globalization and the urge of the State to build an international image in Santa Fe where the Other is the one previously living in the site, the people previously living in Santa Fe. At the moment the State recognized in Santa Fe the opportunity of a space to promote the country’s globalization, any form of established knowledge in the area was dismissed to impose a globalocentric knowledge that, as Escobar explains, tends to look for an erasure of place. Appendix 2 shows pictures of the contrasts of Santa Fe taken in March 2014. There still remains a general public awareness of the urban and social problems of the Santa Fe area, but, tools are in place to hide the undesirable views from the residential walled cities sight. Given the vicinity, wealthier people have the need to segregate themselves through gates, fences to hide a reality a few meters away. Grupo Loma is one of the luxury residential complex of Santa Fe; it includes, among other facilities, a swimming pool, restaurant, a gym and a retail store. The area is strictly monitored. To arrive at the gate of the housing development, any visitor has to be announced and identified. The guard collects IDs and registers the visitor before opening the door to La Loma. The intention to separate from the nearby reality is nevertheless not fully accomplished. Pictures in appendix 2 shows how, despite this isolation intent, the moment one curtain is raised, informal settlement are fully exposed just a couple of miles away. In an interview about Santa Fe, one of the project’s architects, Abraham Zabludovsky, stated: “in the west area of La Loma, where the urban image is least pleasant, single family housing complexes in clusters are suggested with the aim of creating interior views and spaces. In the southern area single family housing is proposed with a less unpleasant context”. The unpleasant context here refers to the thousand of displaced people leaving in the displaced slum. As the Megaproject expands, there is continuous yearly investment in real estate, and retail. There are however, no meaningful interventions to improve the infrastructure base of the project, the living conditions of the surrounding settlements or investments in new low or middle-class housing in Santa Fe or close to the area. 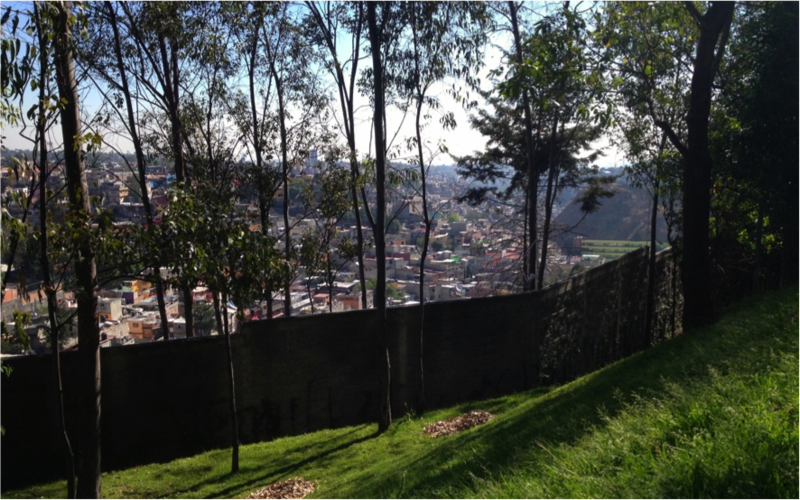 Since 1982, there has been a 350% increase in informal settlements around Santa Fe, particularly on the slopes of hills and ravines with little or no provision for garbage and sewer disposal. The Santa Fe global megaproject has been on the one hand unstoppable and driven by elites and the State with no inclusion of the local residents. On the other hand, the local environment heavily affects the project outcomes and remains a determining factor of the ways in which the new city is perceived. The Global City is inevitably conditioned by the local context that is also affected by the Global City. This phenomenon can be explained with Escobar’s process of localization that should not be seen as the imprint of the global on the local, but as the actualization of a particular connectivity process. This actualization bridges the gap between the local and global, and introduces the glocality concept ascertaining the supra-place effects of place-based politics. Glocality questions to what extent frameworks of analysis allow us or not to visualize actual or potential ways of reconceiving and reconstructing the world from the perspective of place-based practices. New forms of the global can be imagined from this perspective. Glocality analyzes social life by these forms of the global that can be imagined from the local and not the other way around. 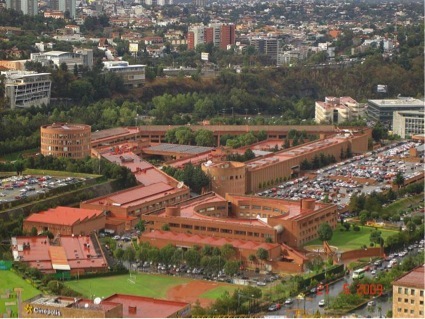 According to the Mexican National Institute of Statistics and Geography (INEGI by its name in Spanish – Instituto Nacional de Estadística y Geografía) Santa Fe gathers places with the highest per capita income live in close proximity to people with the lowest income per capita in the city. This proximity results in multiple and overlapping connections between formal and informal activity in Santa Fe. The fences never manage to fully divide the two sides of the binary; informality is then the constitutive of formality. The urban condition of the city has been determined to a great extent by informal practices not supported but validated by the state. Informal businesses are setlled on the street targeting the low and middle-income personnel of the multinationals or the service people hired to work in the residencies. The government’s goal appears to be the total eviction of informal settlement however, low socioeconomic level workers are needed to support the new massive infrastructure.Czarniawska’s action net is recreated mingling the formal and the informal, where the local context permeates the global intervention that affects the local settlement. We’re tired of trees. We should stop believing in trees, roots, and radicles. 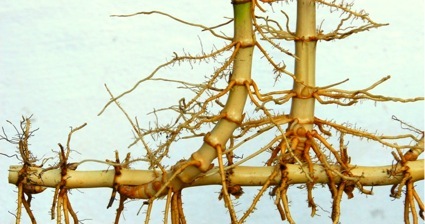 aerial root, adventitious growths and rhizomes. 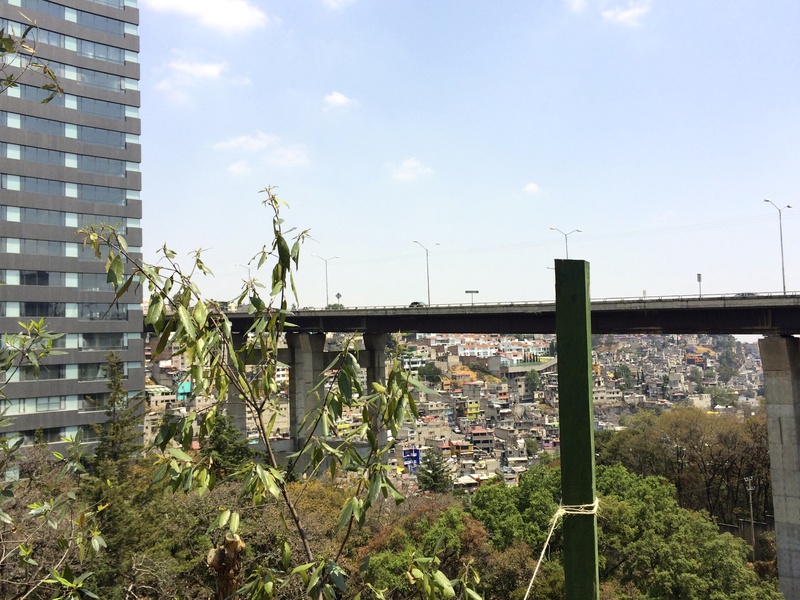 Santa Fe is the home to the richest and the poorest people in Mexico City. The boundaries between the business and residential centers and the slums are blurred as it is hard to delimitate where the one begins and where the other ends. Formality and informality are dependent on one another and different forms of globalizations are presents in the everyday life of Santa Fe. Escobar analyzes Deleuze’s metaphor of Rhizomes by stating that it suggests networks of heterogeneous elements that grow in unplanned directions, following the real life situations they encounter. Informal settlements in Santa Fe were established long time before the Megaproject. They have been targets of repeated displacement yet their expansion has never been stopped or even reduced. The Santa Fe Megaproject started in the rush of promoting a global image of Mexico. Despite the lack of proper urban and social planning and a negligent study of the unstable soils of the area, the billionaire project keeps expanding. Although its sustainability is questioned on a daily basis, the two Santa Fes coexist. Where the settlements stop and where the megaproject starts is not assessable anymore. There is both a rhizomatic multibillionaire project and a rhizomatic slum. The confused coexistence in Santa Fe moves us away from ways of thinking on “binarism, totalities, generative structures, preassumed unities, rigid laws, logocentric rationalities, […] indetermination, tracings, movements of deterritorialization […] morphogenesis, chaosmosis, rhizomes, micropolitics, and intensive differences and assemblage”. The rhizome is an apt metaphor, David Carruthers states, for social-movement networking in Latin America, where generations of activists learned to work beneath the surface during the dark year of authoritarianism and military dictatorships. In Santa Fe, the arbitrary intervention of the state and the private sector was opposed year after year by the informal sector, by both visible and invisible demonstrations. The informal sector’s presence, despite the megaproject expansion, has been maintained, growing across a Santa Fe in a “Rhizomatic manner among multiple social-movement networks, demonstrating connection, heterogeneity, and multiplicity”. The story of Santa Fe, often described as a case of globalization, development and economic growth, is impossible to fit within the classic economic view. The dualism oversimplifies the complex multiplicity of actors, spaces and knowledges that have been consolidating Santa Fe since its early ages. As it is impossible to fit figures 5 and 6 into figure 1, the insistence in representing the reality through the fixed categories only results in the erasure of the reality, the never-ending encubrimiento del otro.